Recently an 80’ motoryacht just off the production line awaiting final fit and finish at the manufacturer’s plant was outfitted with a gplink monitoring system, including bilge and smoke alarm sensors. 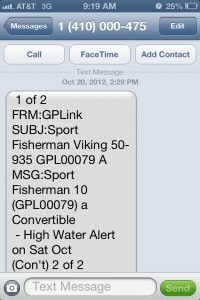 Not long after installation, the gplink concierge received a high water alert from the vessel. The gplink concierge called the OEM representative who went to check on the vessel. The gplink bilge alarm was secondary to an in-house system which the staff had been silencing, assuming there were tests being performed on board. It was not until the gplink concierge called and requested they physically check the bilge that it was discovered that a chiller hose had broken and was filling the boat with water. At the time of discovery, there was already a significant amount of water accumulated in the bilge. If ignored, significant loss and expense would have been incurred. The benefits of gplink continue to surface – and with this scenario, the service proves not only effective as a primary system, but also as an excellent secondary means of safety, security and loss prevention.